It’s the age-old question, isn’t it? For generations, parents worldwide have debated the most effective parenting methods until their kids had kids and those kids had kids. What’s worse, the division lines are strong – parents on both sides of the camp dig in their heels insisting THEIR way is the most effective way to raise children. All the while, desperate parents are searching for genuinely helpful solutions that will finally bring peace into their homes. What about counting to 3? Should I give my kids rewards? What if my spouse and I discipline differently? The list is endless, my friend. I know how endless it is because I once asked all of these questions and more after I reached my limit. Having gone to bed hoarse nearly every night from reminding, nagging and yes, yelling – while still seeing NO changes in my kids’ behavior – I knew there had to be a better way. You can learn all about how I got to this place, but let me encourage you, all hope is not lost. I know because I’ve been there – deep in the trenches of parenting seeing no way out. I firmly believe that knowledge is power, and with the right tools, you can become the parent you’ve always dreamed of being. The disciplining wisdom I want to share with you literally changed the trajectory of my family and thousands of others. The Positive Parenting methods I teach are built on two very firm foundations – Adlerian Psychology and Positive Discipline. Because these tools are rooted in sound science and heavily-researched practices, I can confidently say these tools work for children from toddlers to teens and are effective no matter what circumstances your family may find themselves in. Before we discuss the dos and don’ts of parenting, let’s take a moment and consider the goal of discipline. While each of these goals is completely valid and well-intended, when we pigeon-hole our focus onto one or two problems, we miss the point of discipline. Disciplining, as opposed to punishing, is all about training. It is the idea that we want to guide, instruct, inform and teach our children HOW to behave instead of punishing them for misbehaving. The goal of discipline isn’t short-sighted – it isn’t specific to one problem area. The goal of discipline is a long-term objective. When you’re considering a discipline method, ask yourself if that method will guide and instruct your child to be more like the adjectives you chose. Does yelling at your child teach him how to be respectful to others? Does spanking your child teach her to show compassion or generosity? Does paying your child for good grades teach him to be self-motivated? Does cleaning your child’s room or picking up the toys encourage her to be self-sufficient? The daily goal of discipline is to have your children learn from their mistakes and not repeat them. Unfortunately, most parents have only been taught short-term solutions. And they don’t have the processing skills to reflect on what they did wrong and what they could do differently next time. But they DO have the emotional awareness to know how frustrated they are with mommy or brother or friend. 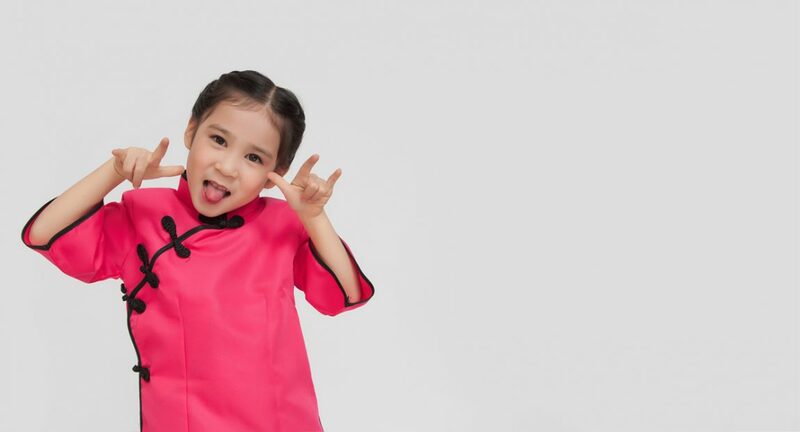 The problem with time-out (and counting to three and spanking and taking away privileges) is these punishments fail to teach or train the child the appropriate way to respond in a situation. Just because a child is told “no” over and over doesn’t mean he inherently understands what behavior would receive a “yes.” Without proper training, kids will keep up the same behaviors despite the punishment. When you reframe your discipline strategies by considering long-term goals, you can focus on the small training decisions each day that will teach your child how to be a capable, resilient and respectful adult. That’s the key to correcting our kids’ behaviors – giving them the tools they need to learn an alternative POSITIVE behavior to replace the negative behavior. When we punish with the intent to have the child “pay” for their mistake, it doesn’t help her learn how to make a better choice next time. Punishment often leads to power contest, and because our kids know poor behavior gets them attention, they’ll keep doing it. 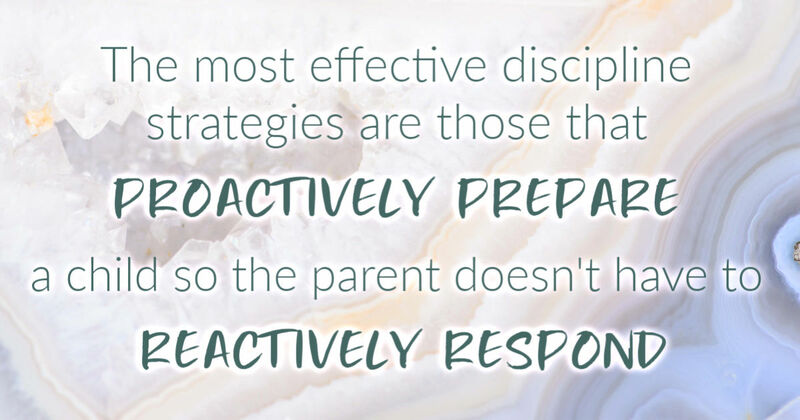 The most effective discipline strategies are those that PROACTIVELY PREPARE a child so the parent doesn’t have to REACTIVELY RESPOND. Successful discipline requires an initial investment up front. But trust me, my friend, your initial investments will have great behavioral payoffs in the long run. Kids need attention, plain and simple. If we don’t keep that “attention basket” full with positive attention, kids will seek out any attention they can get – even negative attention. They’ll push our buttons with negative behaviors because to a kid, even negative attention is a “deposit” in the attention bucket. This doesn’t mean you have to be at your child’s side 24/7 – just taking a few minutes a day to spend one-on-one with your child, distraction-free and doing something they want to do, will reap immense rewards in their behavior. Take 10 minutes once or twice a day with each child and play a game they’ve picked or read their favorite book. Let the phone go to voicemail. Don’t respond to the text. Let the dishes sit in the sink. When you fill your children’s attention baskets positively and proactively, your kids will become more cooperative and less likely to seek out attention in negative ways. Life is busy for everyone, and finding extra time in the day may be daunting at first, but think of this as an investment in your relationship with your children and in improving their behavior. When it comes to knowing how to discipline your child, giving them what they need to avoid poor behaviors in the first place can have a great impact. Note: For Positive Parenting Solutions Members, refer to Session 1 to learn the secrets to easily implement Mind, Body and Soul Time into your already too busy day! Also see the advanced module, The Busy Parent’s Guide to Mind, Body and Soul Time. As you think about how to discipline your child, it’s important to remember the root meaning of the word – teach, instruct, guide, inform. The best way to discipline your child is to help her make better choices by teaching her the correct behavior or response. Role-playing is a great way to do this. For example, if your child is having trouble sharing and this results in her hitting another child, instead of whisking her away to time-out, diffuse the situation and show her the appropriate way to respond. And here’s the fun part – switch roles and pretend you’re the child and let your little one direct you through making better choices. And remember, like anything, this will take consistency and repetition. Don’t expect your child to respond appropriately after one round of role-playing. 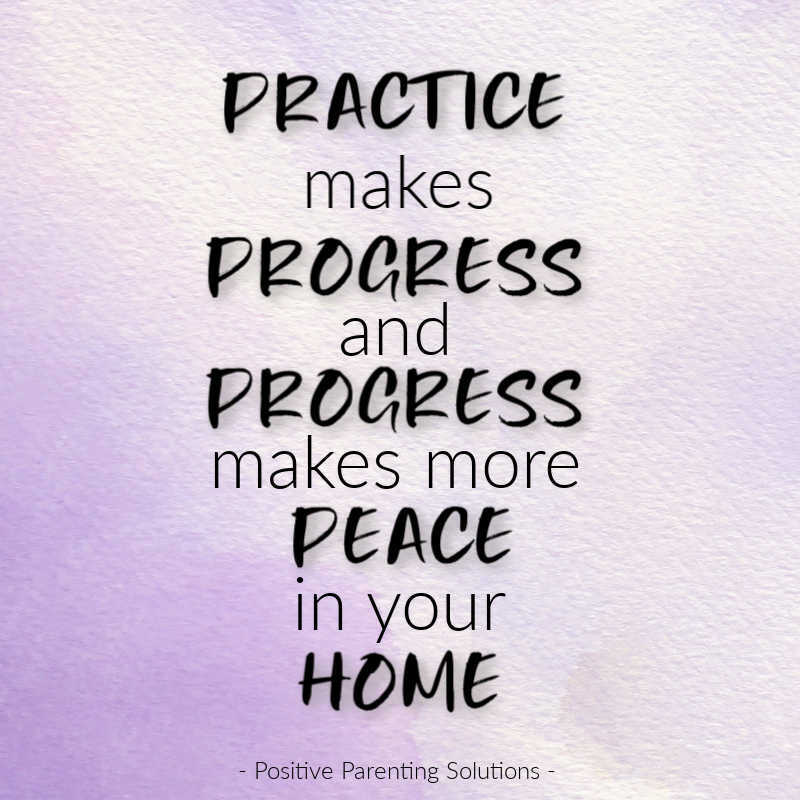 But practice makes progress and progress makes more peace in your home. With the busyness that plagues families today, it can be difficult to be consistent in your daily schedules. But the reality is, kids thrive when they have structure and know their boundaries. When the expectations are clearly communicated in advance, kids have a framework to work within. This doesn’t mean you need to go overboard with hundreds of rules, but focus on what’s most important for your family. Be clear about the ground rules and what happens when someone breaks the rules – make sure that everyone understands the consequences ahead of time and that the discipline is related to the misbehavior. If he refuses to adhere to your technology time limits, he loses his technology privileges for the next day or week (depending on the age). But, making her clean the garage because she didn’t do her homework isn’t related and is therefore not an appropriate consequence. Above all, be consistent. Follow through every time with the agreed-upon consequence when kids push the rules. Note: For Positive Parenting Solutions course members, refer to Session 3, Lessons 25 & 26 for everything you need to know about implementing effective consequences in your home. My friend, this parenting ride can feel overwhelming! I hope you’re feeling a little more hopeful as you implement these starter discipline strategies. Unfortunately, I can never get all of the information I’d love to share with you in one little blog, but I’d love for you to continue learning with me! If you still have discipline questions, I’d be honored if you’d join me for a FREE ONLINE CLASS. I’ll teach you how to get your kids to listen without nagging, reminding or yelling! Wishing you all the best on your parenting adventure!